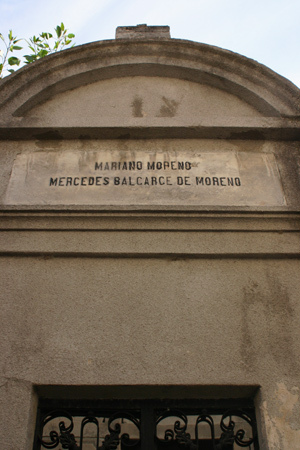 One of the most recognized protagonists of Argentine history, Mariano Moreno is not buried in the simple, unadorned tomb pictured above. He died before the cemetery was founded onboard a ship traveling to the UK. His body, wrapped in a British flag, was lowered into the sea off the coast of Brazil. 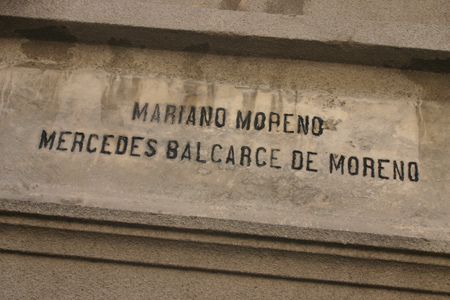 However Moreno’s son also shared his father’s name & built the family vault. Mariano Moreno (father) was born & raised in the neighborhood of San Telmo in Buenos Aires to a family of limited economic means. His studies were significantly delayed until Moreno’s family could afford to send him to Chuquisaca in modern-day Bolivia. Once there, Moreno’s life changed as he became fascination with social theory involving man’s freedom & fell in love with María Guadalupe Cuenca. She had been destined to enter a convent, but Moreno’s love was so great that he convinced her family otherwise. Mariano Moreno (son) was born in 1804. Moreno & family returned to Buenos Aires after he tried unsuccessfully to defend the rights of the indigenous population. By the time of the May Revolution & the Declaration of Separation issued in 1810, Moreno accepted nomination as a secretary of the Primera Junta (along with Juan José Paso). During this time Moreno founded the National Library & became heavily involved in national politics. National organization proved difficult & Moreno headed a faction opposed to President Saavedra. When his faction lost a key vote, Moreno attempted to resign… & was denied. As a way of separating Moreno from local politics, he was sent on a diplomatic mission to England. During the journey, he died of an accidental overdose of a medication as prescribed by the ship’s captain. A 1946 decree from the national organization for heritage protection states that a cenotaph for Mariano Moreno should be located in Section 7. These days it’s missing. 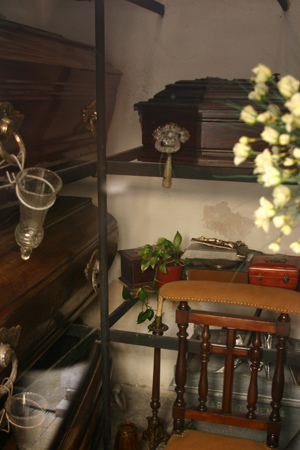 But at least María Guadalupe Cuenca is buried alongside her son the Moreno family vault… sadly minus her husband. Gracias Nicolas. Uno de los motivos para seguir con la pagina es justo lo que mencionaste: se puede sentir mucho estando cerca de los proceres… y no soy argentino! :) Saludos! Lamento que esté en inglés porque no se ese idioma. Sólo pude leer que Mariano Moreno es uno de los más reconocidos protagonistas. Y es así; fue el paladín y promotor de la Revolución de Mayo. Gracias por publicarlo. Saludos cordiales.